I hope you all had a wonderful Thanksgiving! It was amazing for us to have Jax home for his first Thanksgiving! Because of Jax’s weak immune system and fragile lungs, we weren’t able to go to the big family gatherings. But we had a great time hanging out all day as a family finding all kinds of things to be thankful for. 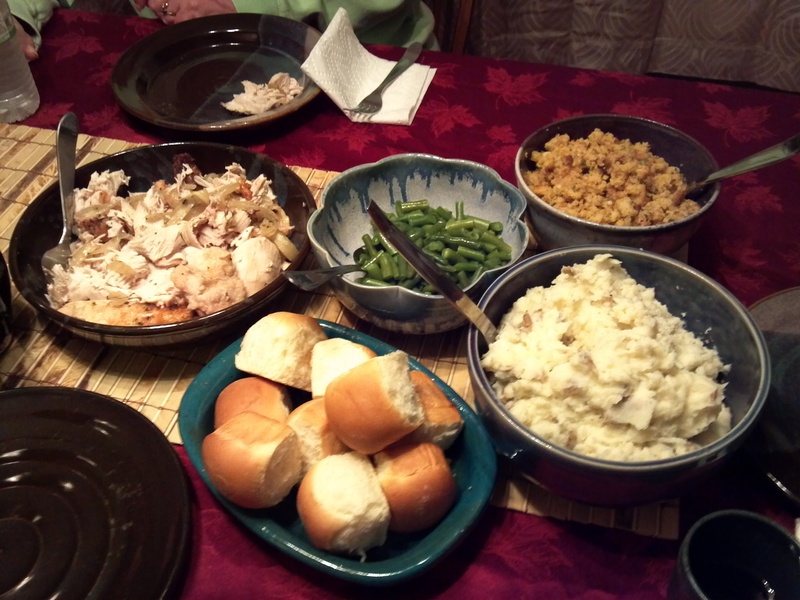 I even cooked my first turkey! My dad and Steve’s mom came over for dinner. It was great: low key and relaxing. Good thing, too, because the rest of the week wasn’t as easy! On Monday, we met with the urologist. Jax’s hernia surgery is on January 15. That ought to be a fun morning… They have food restrictions for babies just like they do adults – we’ll see how that one goes! We got the first appointment of the day (7:00 am), so hopefully Jax won’t be starving for too long! He will spend the night in the hospital. This is what Jax thinks of all these doctors appointments! On Tuesday, we had an appointment with the pulmonologist or lung doctor. She said that Jax’s lungs sound great! She’s really pleased with his progress. We are now able to take Jax off the oxygen for up to 4 hours a day. This is so amazing! I can’t tell you how nice it is to be able to give him a bath without all the tubing and oxygen tank in the way! In a couple of weeks, we will do an in-home test where we will hook him up to a special pulse oxymeter that records 24-hours of his breathing, oxygen levels, and heart rate. Depending on the results of that test, he may be able to ditch the oxygen all together! Then, on January 30, we will have a very involved sleep study where we will spend the night in the hospital hooked up to all kinds of different machines that measure in more detail his levels, patterns, and rates. This study is more for long term diagnosis and treatment plans. However, the doc is very confident that this study will go off without a hitch! Even after he’s off oxygen, he will probably continue to see the pulmonologist to make sure that his lungs are developing properly. On Wednesday, we had an appointment at the pediatrician. He loves Jax! He said “We’re all just trying to make sure we’re doing the right thing. Only a handful of 23 weekers have ever survived and only a couple have ever done as well as Jax!” I love hearing the doctors say stuff like that! This kid is amazing. Next week, Jax will have his 4 month immunization shots. That’s right, this boy is 4 months old today! Hooray! Can you believe it?! Have I ever explained “adjusted” age to you? Adjusted age is the age a baby would be if he was born on his due date. To calculate “adjusted age”, you take the babies actual age and subtract the number of months he was born early. So, since Jax is 4 months old and was born 4 months early, right now he has an adjusted age of zero. 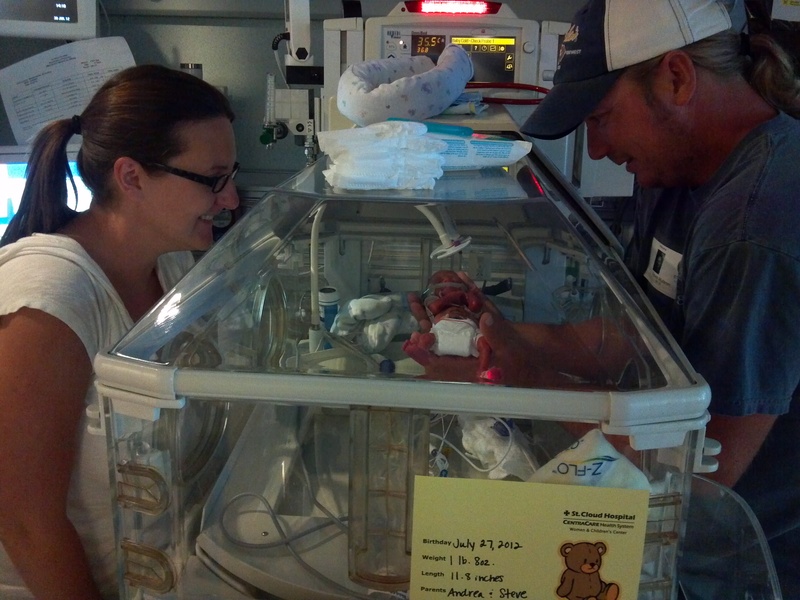 Preemies get a little bit of leeway when it comes to developmental things. Jax gets those extra four months to do things. For example, if most babies start to smile at 2 months old, we can expect Jax to smile at 6 month old (actual chronological age). We will use adjusted age until Jax is about 2 years old. By then, he should be “caught up” with other kids his age. On Friday, Jax got his second out of five monthly Synagis shots. 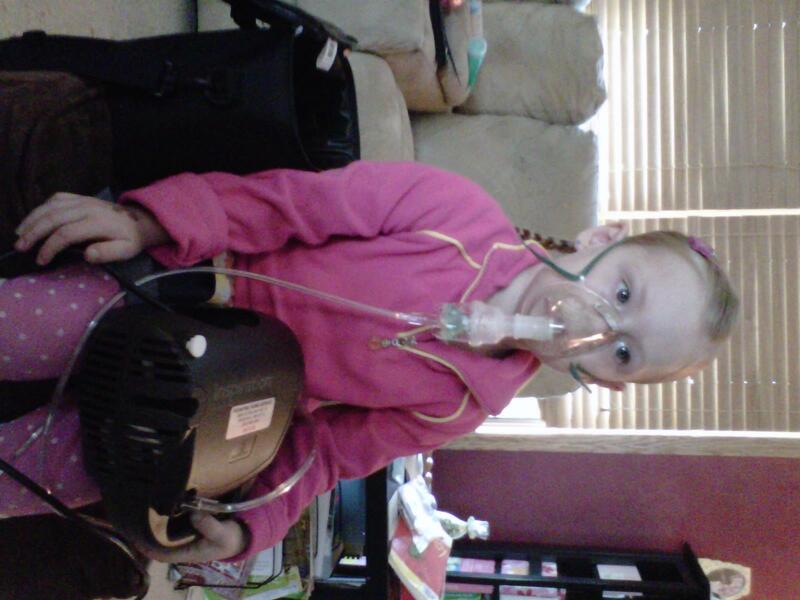 Synagis helps prevent a serious lung disease caused by respiratory syncytial virus (RSV) in children at high risk for severe lung disease from RSV. This shot is a coveted item – many insurance companies do not approve it because the cost is so high. One shot costs about $1500. We are lucky to have this available to us. RSV is a very serious virus that would put Jax back in the hospital. Last night, we had to go to the hospital for some tests so we decided to stop by the NICU and say hi to our nurses! It was really fun to see them and they loved seeing Jax. April, one of our evening primaries, said “holy cow – is that the same kid? !” I think it’s a nice surprise for them to see kids they took care of – they probably don’t really get much of a chance to see how their work changes lives after the babies are released from the hospital. We decided that we will stop in every time we are at the hospital. I’ll tell you what, this job is much harder than my “regular” job! This week is a treat – we only have one appointment! Jax will have an eye exam on Thursday. Let’s all hope that nothing has changed – or even better, that the ROP is healing even more! I realize this is a “nuts and bolts” type of post – all kinds of details and not too much “flare.” I felt so overwhelmed yesterday with insurance calls, surgery scheduling, appointment follow-up, and paperwork, plus taking care of a newborn! But it helps me to process everything when I write it down. I really appreciate you “listening” and being a part of our journey. I especially love it when you comment and give encouragement. 🙂 What do you have questions about? What do you want me to write about next? Love reading your updates! He looks amazing, and seems to be doing so well! Keep up the great work Jax, and Mom and Dad too! Jax’s biggest fans from Rochester are so inspired by all your and Jax’s achievements!!!! We would love it if you wrote about your favorite moments with Jaxson so far. 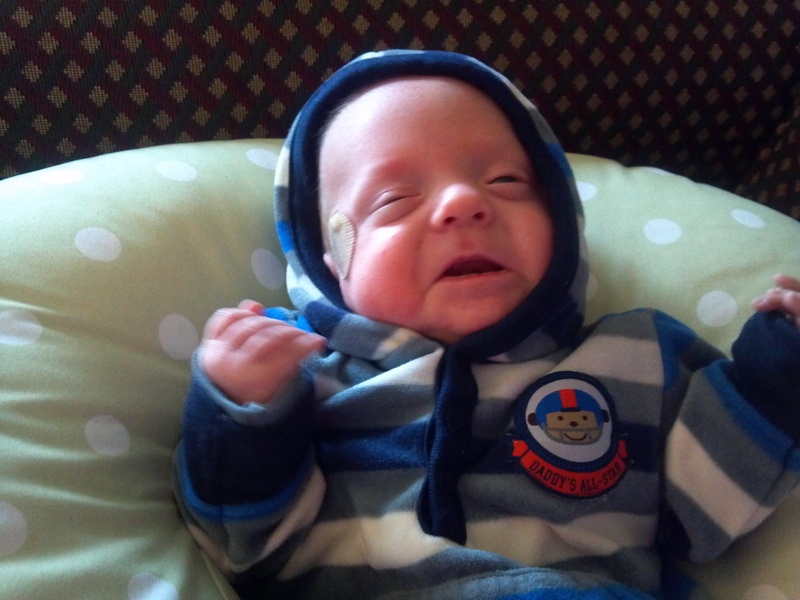 Jaxson, you are a true miracle! Definitely your Guardian Angel Gwenn and Guardian Angel Steve’s dad!) Continue to fight bud .as you are doing awesome! God Speed Jaxson! Andrea and Steve truly great parents! You’ll look back at this 5 years from now and think hmm. Maybe not as I’m 40 and my mom still states that if I would of been the first child, I probably would of been the only child. I was in the hospital more then I was at home for the first 2.5 years of my life. So hang in there! God Speed Jaxson! ) Have you put picts in the scrapbook yet? Andrea reading your blog has been wonderful. I think it is great that you have an outlet to express everything you are going through. Modern technology is wonderful not just for this purpose but for the purpose of saving your AWESOME little boy. Jax is amazing & I love being able to hear all about it. I have shared your story with everyone I can. You are an amazing mother & life will only get better! Hang in there & remember all the people who love & care for you and your family. Came across your blog from a post on Life After the NICU. Where are y’all from? I have a little 24 weeker who is now 6 months actual/2 months corrected. We spent 4 months in the NICU. Your little guy is so cute! It is so encouraging to see other babies doing well. I’m just scared of what is to come (we started solids and it isn’t going overly well yet). Hi! We’re from Minnesota. How about you? Congrats on the 6 month mark. Wow – solids – I haven’t even thought of that yet! I know what you mean about being scared of what’s to come…it’s almost like I’m waiting for the other shoe to drop. Wow! I thought my life got nutty with 5 kids and various grown up schedules! Its wonderful to read about Jaxsons amazing progress. He is one handsome boy. Who is your urologist? Are there developmentalus milestones that they are looking for already or are all of those related to “adjusted age”? Thank you so much for keeping us in the loop as to how your little guy is doing. My kids love hearing how he’s doing. 5 kids?! Yes – you have a crazy schedule, too. Our urologist is Dr. Wolpert at Children’s in St Paul. He’s great – we really like him. We met Dr. Wolpert once before. Very nice. We see Dr. Hutcheson for my youngest and her kidney issues. I wish we had found them right away instead of when she was 2 it would have made life easier now. Good thing to have the right people in your corner from the start. Definitely a huge help to have a good team! Is Dr Hutcheson at the same practice as Dr Wolpert? How is your daughter doing now? Thank you for sharing Jax’s progress! What an amazing little boy you and Steve have! Way to go Jax! Thinking of you, enjoy the holiday season! Thank you! How are the boys doing (all three of them!)? Hi Andrea! Andrew and I send our love. I can’t get enough pictures of your sweet little boy. He is so beautiful! Thank you for sharing your thoughts and feelings. I have felt so far away from you these last few months, but reading your posts makes me feel closer to you. You have been able to share (as best as you can) what this unique journey has been like for you all. Thank you for opening your heart to everyone and letting us all in. It’s a lot to process, I’m sure, but you are one strong mama! I look forward to learning more about Jax as things progress. Love from San Diego! I love reading about your amazing little boy! It is so awesome that he’s such a trooper. Keep up the good work Jaxon! You too Mom and Dad! I think you’re right – I don’t think this awe will ever go away. I’m sure you feel that everyday with CJ! Ugh – insurance!! Seriously Jax is amazing!!! 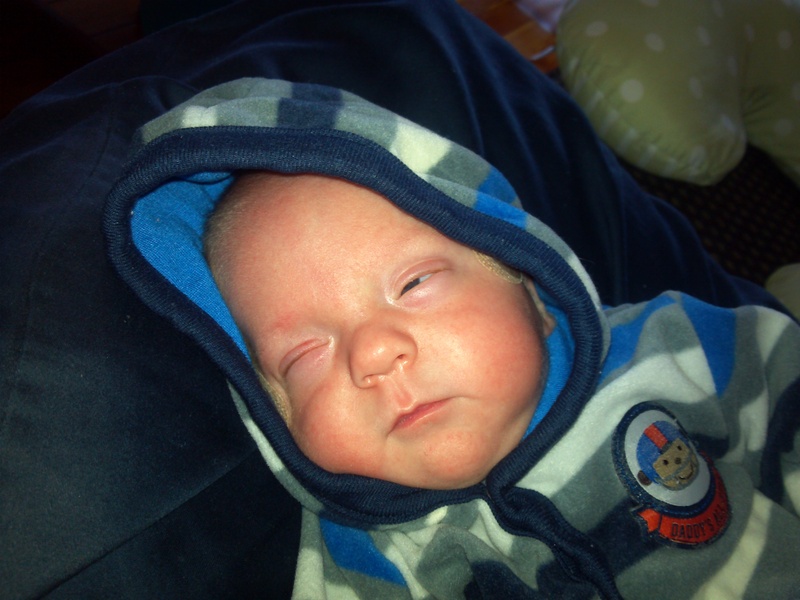 My cousin’s 23 weeker has had a much different story. She and Jax are both amazing little people though! Wow, show ’em Jax!! Andrea, I so love reading your blog. Hope you don’t mind that I shared it with a new mom of 29 week twins that lives in Lakeville. She is about to take her boys home this week. She saw your article in the paper this week and asked if this was the little boy I had told her about. You are such an inspiration to other mom’s of premis. Don’t you love “Dr. Tim”? You are in very good hands with him. Glad you got back to see some of your nurses. You are right, we love to see our babies come back to visit. Once again, if you need a break (especially during the day) let me know. Maybe your aunt and I could hang out while you got some Christmas shopping done. Take care, and enjoy that boy! Please – share away! I really want to meet other mom’s of preemies in the area! Your a GREAT Mom and Dad. Previous Previous post: Happy Due Date, Jaxson!